Our team can treat smiles at any age, but there is usually a best age for treatment to begin. An early examination determines how and when a child’s particular problems should be treated for maximum improvement with the least amount of time and expense. Early treatment may achieve results that are unattainable once the face and jaws have finished growing. Children sometimes exhibit early signs of jaw problems such as an upper or lower jaw growing too much or not enough or one that is too wide or narrow. If children over age six have these jaw issues, they are candidates for a first-phase orthodontic treatment. Children can benefit enormously from first-phase orthodontic treatment which typically lasts a year. Specific appliances, like palatal expanders, can be prescribed that direct the growth of the upper and lower jaws toward an ideal alignment. Thus, a good foundation can be established providing adequate room for eruption of all permanent teeth. After the Phase One treatment is completed, all appliances are removed and the eruption of your child’s permanent teeth will be monitored at office visits about every four to six months. 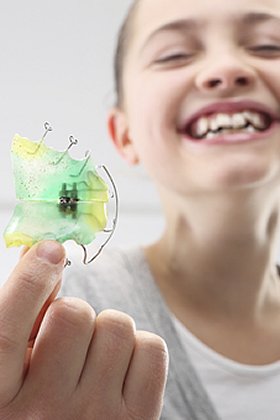 Retainers may or may not be recommended during this observation period. At the end of the first phase of treatment, the teeth are not in their final position. This will be accomplished in the Second-Phase Orthodontic Treatment. Each tooth has an exact location in the mouth where it is in harmony with the lips, cheeks, jaw joints and other teeth. When this is established, the teeth will function together properly. Here, they will remain healthy and look the most attractive. This is the goal of the second phase of treatment. The second phase of treatment is started when most of the permanent teeth have erupted and usually requires braces on all teeth for approximately eighteen months. Contact us to schedule an orthodontic evaluation for your child.